Plants are able to reproduce in a number of weird and wacky ways, but have you ever heard about seeds that wiggle and hop their way towards germination? Themeda triandra, commonly known as kangaroo grass, is a native perennial grass that grows widely across Australia. It produces spear-shaped seeds that are activated by water, either through increased humidity or when it rains. These hygroscopic seeds wiggle, wind and jump their way across the landscape in search of a suitable place to bury themselves and, ultimately, begin to grow. 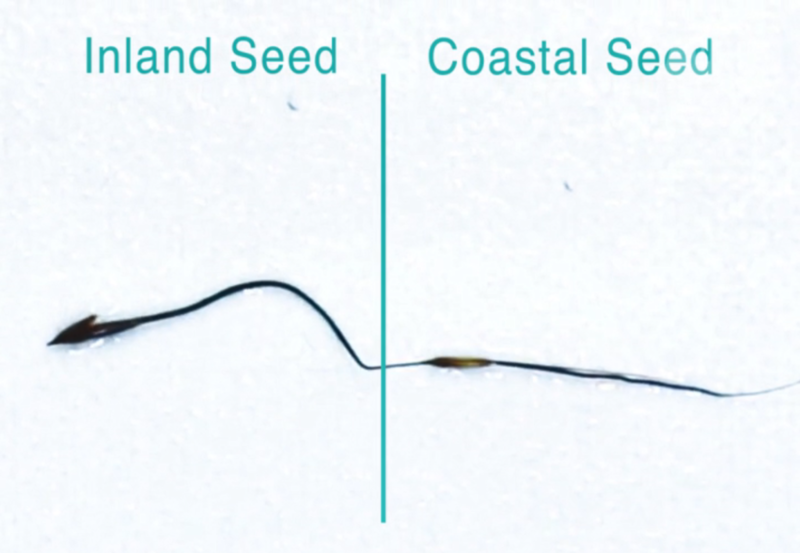 Last summer Dr Bob Godfree and our summer vacation scholar Annette Cavanagh began to experiment in the lab with the way kangaroo grass seeds move. The seeds of kangaroo grass plants from inland populations have larger seeds with longer tails (awns) than their coastal relatives. They can travel further and faster over short distances along the ground. There are also significant genetic differences between some populations: inland plants are more likely to be polyploid than their coastal relatives, which are usually diploid. Polyploid means having multiple sets of chromosomes. Diploid individuals have two sets (like you and me). Polyploid plants have multiple sets. Some plant species can have different ploidy levels and it’s often hard to tell polyploid plants from their diploid relatives. Kangaroo grass plants usually posses either two sets of chromosomes (diploid) or four sets of chromosomes (polyploid). It has long been theorised that polyploidy is advantageous for plants growing in extreme habitats. In a recent paper, Bob and colleagues showed how this works in kangaroo grass. “In our experiments we found that drought and heat-stressed polyploid plants produced over four times as many seeds as diploid plants under the same conditions. The seeds of polyploids were also consistently heavier and had longer awns, which is the tail-like mechanism that the seeds use to manoeuvre themselves across the ground,” Bob said. “Polyploid kangaroo grass seeds are able to transport themselves greater distances than diploid seeds, which increases their chance of finding a suitable location to grow. This also expands the distribution of the species and reduces competition for resources between the seedlings and the parent plant. “Seeds with longer awns also seem to be able to bury deeper into the soil, which we think might give them an advantage in harsh environments, including arid areas,” he said. Being able to withstand drought and heat-stress is a very convenient trait to possess in a warming environment. “Polyploidy might be a useful trait to consider when selecting plants for restoration purposes in a changing climate,” Bob said. Bob and Annette, who is now with La Trobe University, are continuing their experiments by measuring awn length in other species of Australian grasses, using seed from plant specimens in the Australian National Herbarium. “We’re interested in species with broad geographic coverage that have awns that differ in size and shape. We want to find out whether there is evidence for evolution towards longer awns in drier and warmer environments,” Bob said. I noticed that the aggressive adaptability of inland kangaroo grass paired with the larger spear-like tip are particularly harmful and painful for dogs; it not only burrows into the fur, but under the skin. Once the awn breaks off, the seeds become extremely hard to see in the fur, and are too small to be removed without using tweezers. Removing draws blood, which is an indication of the depth to which it is embedding. hI – I have some growing in my garden on the gold coast – I think they are great and look good. Great why cant we harness the genetic disposition of kangaroo grass and cross polinate them with wheat barley rice and other food producing grasses and increase the food supply in the world. have you ever seen if you plant vegetables how grasses overrun the vegie patch so could the kangaroos grass charasteristics be implanted in food producing vegetation and cause bumper crops to feed the starving.